Sandwich tern Thalasseus eurygnatha, photographed by Mikko Pyhälä. The Laridae include the gulls and terns, primarily coastal birds with long, broad wings, relatively short legs (compared to other members of the Charadriiformes) and feet webbed between the front three toes. 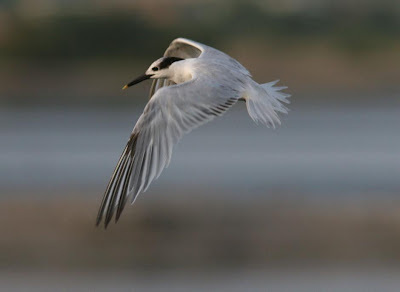 The family is generally divided between the Larinae, gulls, with broader wings and stouter bills, and the Sterninae, terns, with more elongate wings and slender bills, but the phylogenetic analysis by Jetz et al. (2012) places the noddies (Anous) closer to the Larinae than to other Sterninae. These are dark-plumaged terns with pale caps; the noddies and the white terns Gygis are found in tropical regions and usually nest in trees and shrubs rather than on the ground like other larids. Jetz et al. (2012) also place the skimmers of the genus Rynchops within the Laridae; these tropical and subtropical birds have the lower mandible markedly longer than the upper, and they use this elongated mandible to skim along the surface of the water while in flight and pick up small fishes and aquatic invertebrates. [A68] Ashmole, N. P. 1968. Body size, prey size, and ecological segregation in five sympatric tropical terns (Aves: Laridae). Systematic Zoology 17 (3): 292-304. [G66] Gould, J. 1866. Additions to the list of the avifauna of Australia, with descriptions of three new species. Proceedings of the Zoological Society of London 1866: 217-218. [HR96] Heather, B. D., & H. A. Robertson. 1996. The Field Guide to the Birds of New Zealand. Viking: Auckland. [HWT01] Holdaway, R. N., T. H. Worthy & A. J. D. Tennyson. 2001. A working list of breeding bird species of the New Zealand region at first human contact. New Zealand Journal of Zoology 28: 119-187. [S70a] Schnell, G. D. 1970. A phenetic study of the suborder Lari (Aves) I. Methods and results of principal components analysis. Systematic Zoology 19 (1): 35-57. [S70b] Schnell, G. D. 1970. A phenetic study of the suborder Lari (Aves) II. Phenograms, discussion, and conclusions. Systematic Zoology 19 (3): 264-302. [S18] Stone, W. 1918. Birds of the Panama Canal Zone, with special reference to a collection made by Mr. Lindsey L. Jewel. Proceedings of the Academy of Natural Sciences of Philadelphia 70: 239-280. [SU93] Sonobe, K., & S. Usui (eds.) 1993. A Field Guide to the Waterbirds of Asia. Wild Bird Society of Japan: Tokyo.